The second presentation of the circle INFLUENCE ! 2018 are two contemporary female positions, a show connecting Winnipeg with Teheran via Vienna. Politicians nowadays deny climate change and swing to the right – even if it had never been that obvious. Our responsibility is to compel our respective governments and fellow people to assume theirs. Even if the two artists are using the same medium, photography, and kind of the same topic, their work can´t be more different. While Sana Ghobbeh is playing with the cliché of souvenir images and putting in the controversial question whose shoes are in the motives, Sarah Ciurysek is building up kind of sliding doors, to the underworld or other dimensions. Though both are bringing up the question of being rooted or unrooted. Fallen trees, fold in on itself, can be a sign of destruction and death as well as new life will be established soon, a new universe will grow out of the old substance. Left shoes are a sign of disappeared people, but also a sign to remove civilization, like a exemption. Every medal has two sides and there are diverse possibilities of interpretation in between. But even if you will follow the positive interpretation, questions about status quo of our society, self perception and our handling of natural resources and how to protect nature are appearing. The subtle manner how Ciurysek and Ghobbeh are layering diverse topics and creating amazing art work is quite specific and makes the show so attractive. Sarah Ciurysek is mainly working in photography, video and installation, examining the relation between human beings and nature. The tight relation between growing and dying, the sensibility of our natural environment and the way how we are treating or abusing it. The works reference graves, life, death, birth, history, archeology, nourishment and is focusing at use of human resources. Topics like the waste of resources, the change of climate, the destruction of virgin forests emerge as well as fairy tales of little folk living in tree stumps. The poetry of the photographs are overlaying the deeper input in a artistically beautiful way, but not covering it. Her embroidery is a transformation of her images matched with the bark of the fallen stumps into another medium. The play of light and shade, of color and hues, of the structure of velvet, generates an unpredictable effect. Sana Ghobbeh´s topic is based on an experience she had 2014 during her residency in Vienna. Sana collaborated with the Syrian artist, also a resident at the Austrian Federal Ministry for Education. (Let´s play 2014). But this was only the initiative approach, meanwhile the project had developed an increasingly complex life of its own. Different ideas allow many inferences to be drawn about the significance of the series. Starting point, Huda from Syria left her shoes behind for Sana and she traveled with these leftover through Europe, in a period of one year with a visa, between October 2014 and August 2015. Sana did the trip with her invisible friend and did all these well known touristic photographs. Instead a person there are only shoes. On one hand it is an ironically reference to memorial photos, which are not different, even if the photographers are from far away and form different ethnically societies. On the other hand the photographs leave a kind of Blues. Where is the person who normally is wearing these shoes, what had happened? Burdened images from the war and Nazi cruelties appear as well as pictures of refugees on their long trip to Europe. In the common iconography left shoes are put on a level with lost life. But there is another point of view – leaving shoes can also be a sign of liberation. To wipe the fetters of civilization off and to root yourself. It´s not only about freeing the feet, it is more about to discard the corset of society. It is also about the phenomenon not being rooted deeply in the earth. Not to be institutionalized so much in the sense that we can play with freedom. At the same time it is about what we see, the look, the apprehension of our own existence. The subject/objects are intertwined like as Jacques Lacan talks about the look and where we look at. (Fonction et champ de la parole et du language ). unearthed, and what makes us think of depth (roots reaching down into the soil) is now standing up on a vertical plane. I like the simultaneous experience of being grounded by the image, because it’s a such a large representation of nature (and a connection to the earth is very important to me), yet there is still something disorienting and ungrounding about them. In some, there is no horizon, and the image seems to fold in on itself. And again, I am interested in how photos can trigger the body… these are body-sized, sensuous, very material images… yet at the core, there is a nothingness. Physicality and mortality are intensely brought together. The physicality of these images is partly due to the process of making them: I shot them on a large-format camera in locations across Western Canada, and then I had to travel to Banff to print them in special mural-printing facilities. Printing analogue photos at such a large-scale requires much time and a full-body commitment, in handling the photos and rolling them through the various chemical baths. 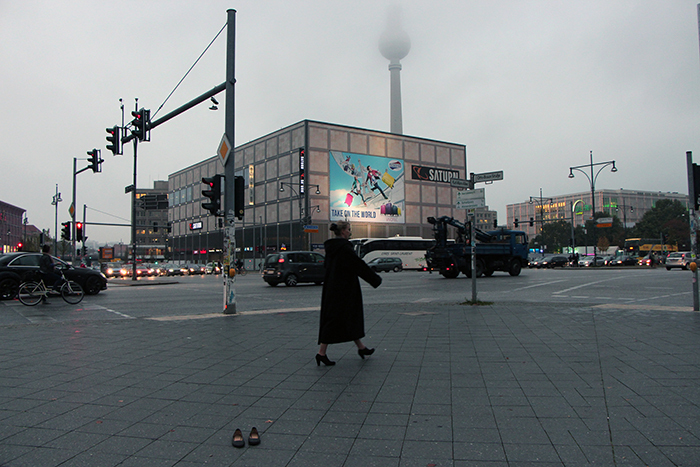 ‘I left my shoes behind’ is a series of photographs taken from a pair of shoes in urban spaces in different EU cities. The idea took shape when the artist had to say goodbye to a friend who was leaving Vienna back to Syria.